As part of the 2015 POPSUGAR Insights Food study, we surveyed female visitors to POPSUGAR to better understand their grocery-shopping behavior and consumption of digital food content. We were particularly interested in discovering the way that women want to consume food- and recipe-related content in the age of the visual web. Overall, 81% of women said that their favorite type of digital food and recipe content is when publishers combine a text article with descriptive photos. This was overwhelmingly the most popular choice, with a photo gallery ranking second with a distant 10%. 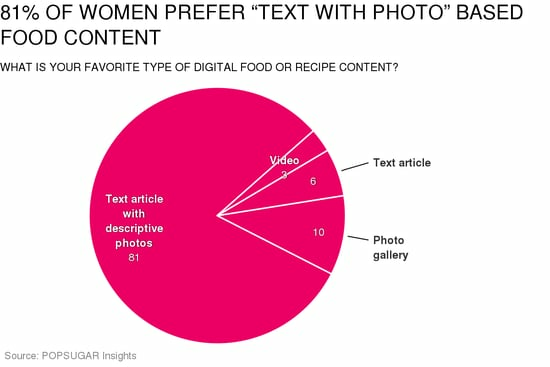 Only 6% of women prefer a straight text article, and only 3% of women we surveyed selected video — which might speak more to where women are consuming food content than to the quality of the content overall.